Winston is very good with Children, other pets – including cats – and is great with clients, Fedex and the Mailperson. He happily tests all the food in our office, if he can get away with it, runs around with tracing paper or anything else he can pull from recycling, and is always available for company on walks to get Sushi. 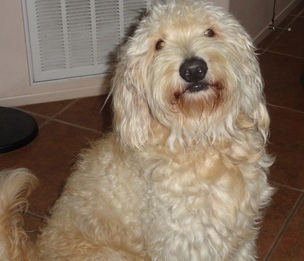 Winston is a Golden Doodle and he is our office Mascot. Winstons favorite chew thing is Pig Ears!